I've never been into romance in any genre whether it be books, movies, or comics. 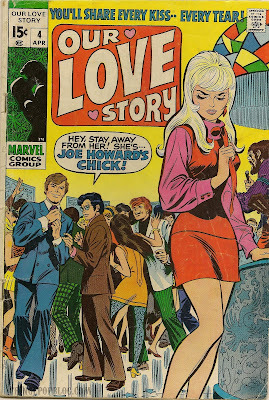 The art on romance comics does intrigue me, though. 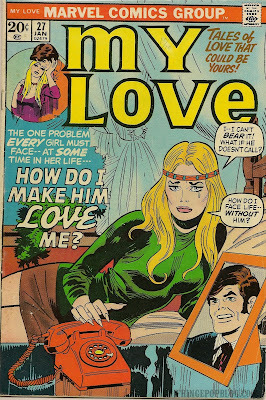 There is typically a major melodrama playing out on the cover, truly the stuff of soap opera, complete with back-stabbing, cheating, and big comic book tears that look like they are out of a Roy Lichtenstein painting. What intrigued me about the set of 1960's comics I'm featuring is the 60's aesthetic. The bouffant hairdos; the neon, mod colors and clothes; and even a few hippies thrown in to really typify the era. 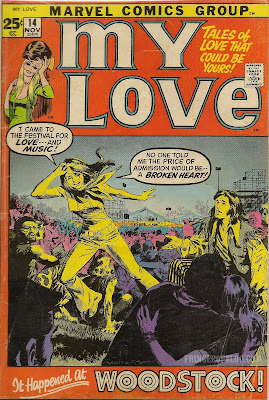 The Woodstock comic is a great little historical piece. 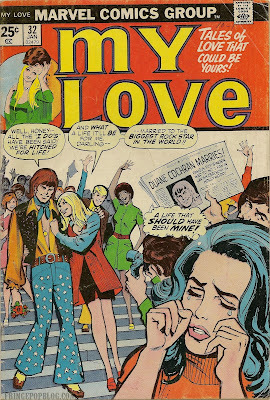 So, enjoy this handful of late 60's/early 70's romance comics. Very interesting indeed. I have read up on Manson, Atkins, Krenwinkle, the rest off and on, but I didn't notice the connection. Speaking of bad trips, Mackenzie Phillips claims her papa John spiked her with heroin, and then raped her at what.....10?? (you probably heard). Fugly. Sort of fringe-pulp potential, however--and lest we forget mama Michelle Phillips knew, like in a biblical way, all the badboy actors, Beatty Inc, etc. and the rockers, as did lil Mackenzie presumably--including those creepy mansonites, who lived a few miles away from the par-tay in the hollywood hills. Snitchapalooza. Very disturbing indeed. I'm happy to say I can't relate to her sad story in anyway. I'm lucky to have had a wonderful father and have been in a happy relationship for 7 years. We don't necessarily believe in marriage (i.e. government sanction is not necessary in our minds) but the legal ramifications of not being married are persuasive.